Chef Dean Fearing knows good food. His gourmet recipes are influenced by his grandmothers, who had a great understanding of Southern food and barbecue dishes. Chef Dean Fearing still uses some of his grandmothers recipes, which always inspire him in the creation of his always unique gourmet recipes. Chef Dean Fearing is also a musician, playing guitar with The Barbwires. 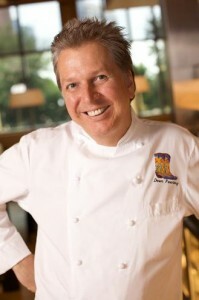 Fearing has won the title of "Best Chef in the Southwest", and is known as "The Father of Southwestern Cuisine"
He is the author of "Mansion on Turtle Creek Cookbook" and "Dean Fearing's Southwest Cuisine: Blending Asia and the Americas." Fearing also has a show on the Food Network "Entertaining at Home with Dean Fearing"
Check out Fearing’s Restaurant website. You'll also find two of Fearing's delicious gourmet recipes in World's Most Beautiful Recipes: "Barbecued Duck Quesadillas with Lime Sour Cream" and "Molasses Duck with Smoked Vegetable Dressing and Peach Chutney".